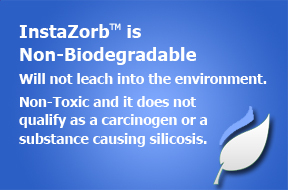 Is non-biodegradable and will not leach into the environment. It is a one step clean-up process that works the first time, every time. Leaves no residue, therefore there are no slip hazards. Contains no crystal silica and is completely safe. 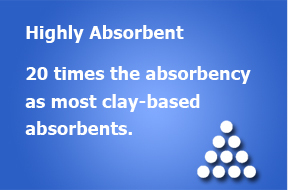 Has unlimited applications and has passed independent laboratory testings. Meets or exceeds all EPA standards for the paint filter, and liquid release tests.here are no slip hazards. 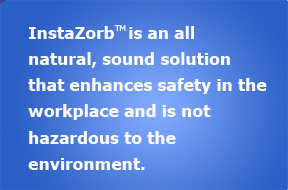 Is completely safe to use with no health hazards, carcinogenicity or flammability problems. and on any liquid or semi-liquid. Drinks – even sticky sodas!